1. Company Name: Screenflex Portable Partitions Inc.
4. Please offer a description of your company’s mission and the scope of its primary products/services? At Screenflex we design, manufacture, and market portable acoustical room dividers to help our customers use their space efficiently. 5. How long has your company served the education sector? When did it begin serving charter schools? We began serving the education market in the early 1990’s. While I am not precisely sure when we received the first order from a Charter School, I know Charter Schools found a “home” with Screenflex dividers several years ago. Accordingly, we exhibited at our first charter School Convention in Albuquerque in 2007. 6. What are the important business challenges your company will be discussing with clients and potential customers at your booth during the National Charter Schools Conference? Our mission at the conference is not to discuss business challenges but rather listen to what the attendees have to say. If they are interested in learning how educators across the globe are making efficient and economical use of their space with our portable dividers, we will be more than happy to show them. 7. How important are the concepts of scalability and flexibility in today’s charter school spaces, particularly those that are startups or occupying temporary facilities? “Nothing is as constant as change” is a phrase we are all familiar with. Administrators have different demands for their space today than last semester and it will be different next semester as well. Accordingly being able to change the configuration of your space (aka be flexible) to discuss needed spatial changes in the layout of the facility is very important. This is particularly true in start-up situations where enrollment may swing dramatically in the first few years or when the school building has been rented instead of purchased. All of our dividers use self-leveling ball bearing casters. After your lease is up the dividers can be rolled out the door, to a truck and moved to their permanent home in your new school…or sold to another school or church. 8. What are the biggest challenges charter schools with open floor plans face when trying to maximize their use of space? After a large, open floor plan building has been acquired and the administrators walk into the cavernous space for the first time they can feel overwhelmed. They shouldn’t. While turning this big empty room into a functional school building may be challenging to you, it is easy for us. As architects, we have a unique way to grasp your needs and put a plan together to discuss those needs. We prepare custom floor plans for customers every day and have dozens of real-life samples on our website. We’ll take care of designing a layout to meet your needs, and you can focus on educating the children. 9. What are the critical components school leaders should look for when considering potential room divider solutions? Good question and I will answer it two different ways. First, the critical components in considering a Room Divider solution is not any different from considering any other major purchase. That is administrators should look for a reputable manufacturer with a well-established track record of providing long-term value and safe products to their customers. That may be common sense, but I believe sometimes it is overlooked. Again…you want to consider safe products from a reputable manufacturer with a proven track record of providing value to their customers. Specifically what critical part should you look for in a safe Portable Room Divider for your school? Here is a list to use: 8. What are the biggest challenges charter schools with open floor plans face when trying to maximize their use of space? After a large, open floor plan building has been acquired and the administrators walk into the cavernous space for the first time they can feel They shouldn’t. While turning this big empty room into a functional school building may be challenging to you, it is easy for us. As architects, we have a unique way to grasp your needs and put a plan together to discuss those needs. We prepare custom floor plans for customers every day and have dozens of real-life samples on our website. We’ll take care of designing a layout to meet your needs, and you can focus on educating the children. End Frame Design for Stability: The most stable things on the planet are wide at the bottom and narrow at the top…i.e. the pyramids or a mountain. So if you want a portable divider with maximum stability, the end frames (the “things” at the end that hold the divider up) should be wide at the bottom and narrow at the top. Acoustical Fire Rated Panels: Sound is absorbed by soft and semi-soft materials. Accordingly, we include not just one but two layers of sound absorbing fiberglass on both sides of every panel. If you ask for a fire test, make sure it is a test on the entire panel. NOT just the fabric. Self-Leveling Casters: Let’s face it…your floors are not perfectly level and neither is ours. If a portable divider does not have self-leveling casters then it will lean in the direction the floor slopes or worse…not touch the floor at all. Thus in the interest of having a stable divider, any portable divider you consider should have self-leveling casters. Dual Interior Casters: Some systems only have single casters on the interior panels. Systems with dual casters are obviously twice as supportive and so more stable. Which would you rather have in your school? Full-Length Hinges Between Panels: Ask yourself which is stronger…a system which uses full-length piano hinges AND TWO SCREWS EVERY 4 INCHES to connect one panel to the next… or something which does not use this technology? Common sense tells us the more connecting points there are between panels, the stronger the connection. Period. Full-Length Connections Between the 2 End Frames and the 2 Lead Panels: The point where the end frames are connected to the lead panel gets all the twisting and turning action as the divider is opened, closed, or moved. A superior connection at this point is critical to having a long life to your Portable Room Divider. What do we do here at Screenflex? We not only insert the panel directly into the end frame but then we screw the metal end frame to the metal frame of the panel from two directions. We don’t stop there. A gusset plate is added to the bottom connecting these two critical components yet again. 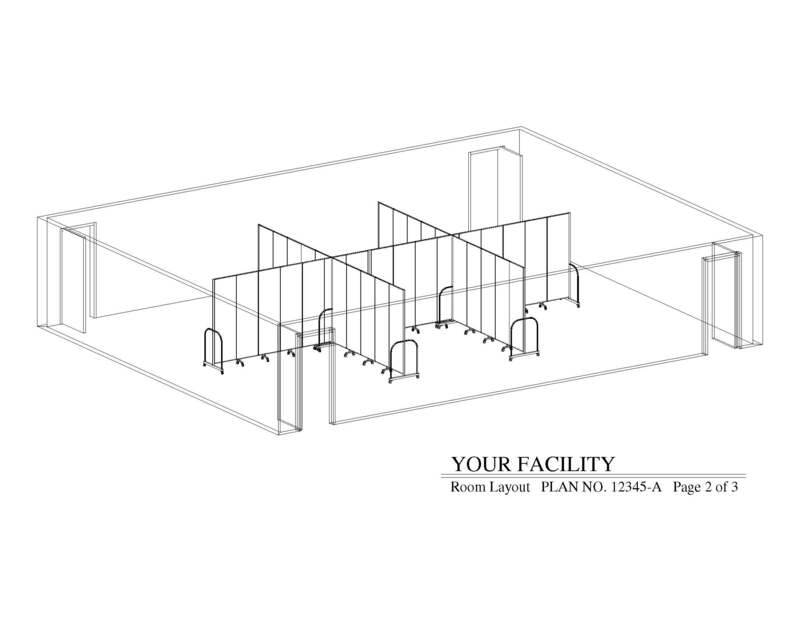 A Means to Help Secure the Panels in Place: A well-built Portable Room Divider will serve you for many, many years. Likely over that time frame, it will occasionally be used for weeks or months at a time in the same spot. Thus locking corner casters and a locking device at the apex of each hinge (Position Controllers) are very desirable features. 10. How are portable room divider solutions, such as Screenflex, able to address noise-level concerns that may arise from the close proximity of the separate class spaces created by the dividers? I choose to address what Screenflex IS doing to help make our Portable Room Dividers sound absorbing as opposed to what anyone else is or isn’t doing. As per question 11, the sound is absorbed by soft and semi-soft surfaces. This is why our “State of the Art” panel incorporates two layers of sound absorbing fiberglass on each side. Underneath the fiberglass is a honeycomb core. The entire panel is inside a galvanized steel frame for remarkable lightweight strength. 11. 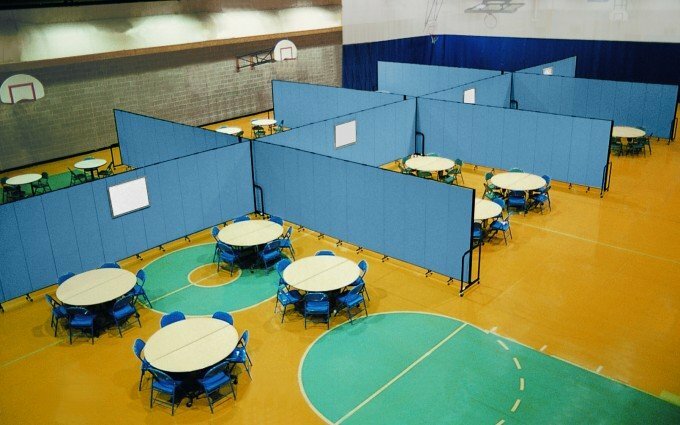 In addition to dividing rooms or creating multiple spaces within larger spaces, how can charter schools use portable room dividers creatively to better serve their students? I love this question! Why? 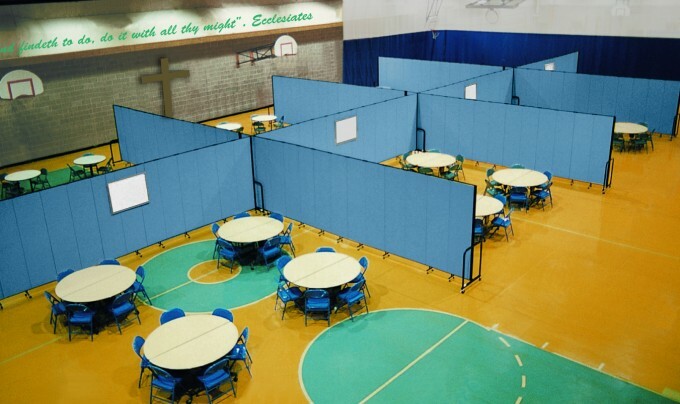 We at Screenflex designed our Portable Room Dividers over two decades ago with the idea to help the school and church administrators have an affordable means to create classrooms in their open areas on a moment’s notice. The classrooms could stay there for a couple of hours or a couple of years as needed. It is rewarding to see how administrators have found many other uses for our dividers. To name just a few…art display boards, science fair or school play backdrops, speaker backdrops, create a computer lab in the library, a temporary office for the district psychologist, ESL or chapter one classrooms, create needed classrooms during construction projects and more. Want to learn more? Seeing is believing and a picture is worth 1,000 words. Feel free to simply visit www.screenflex.com. Click on the Photo Gallery to see dozens of pictures of Screenflex in action helping school administrators just like you. You’ll be glad you did!